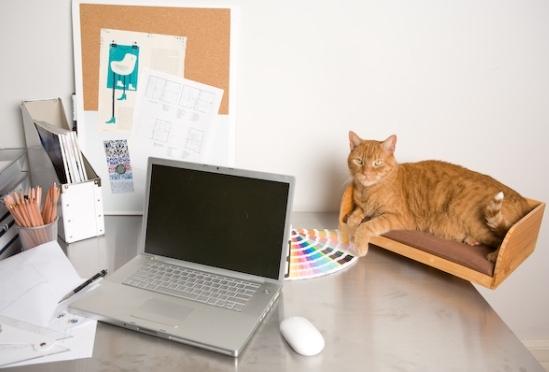 Give Your Feline Their Own Perch On Your Desk | OhGizmo! I have a cat that loves to hang out with me in my office. Usually he will either lie in my lap, or try to make himself comfortable on the desk. I usually don’t mind him in my lap if I’m not too busy, but my desk is too cluttered to accommodate my feline friend. That’s why I need the Kit in Box. This is a nice little bed for your cat that clamps onto the edge of your desk. This gives your furry friend someplace out of the way that they can hang out while you work. Of course the trick is getting them to actually use the bed and not just try to plop down in their favorite spot on your desk. If they actually use it, then your $50 investment would likely be worth it. Whatever keeps them off the damn keyboard! ya, that thing doesn’t look too safe, kitty’s going to take a bruisin’ when that thing falls off the desk! Put some important looking papers in that bed, make it look like an in box, and be sure to pick the cat up and move it elsewhere the first couple times it plops down. Voila! You won’t be able to get them out of the damn thing. Yay for cats.